The best way to get to know a community is by scheduling a tour. See the facilities, meet the staff and residents, and get a feel first hand what it's like to live at Juniper Village Wellspring Memory Care at Brookline Memory Care. 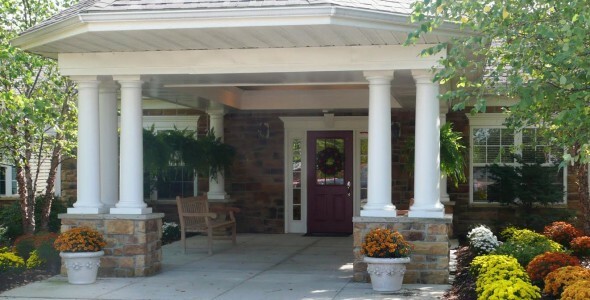 Juniper Village Wellspring Memory Care at Brookline offers delightfully homelike memory care in State College, Pennsylvania. With meals, activities and loving caregivers, we are there to enable independence while providing the services needed to not only thrive, but enhance senior years. Founded in 1988, Juniper Communities is committed to making the world a better place, where each of us can live fully throughout life's seasons. We nurture the spirit of life with each resident's life we touch with a resident-centered approach that maximizes physical independence and emotional wellbeing. Today we operate 15 senior communities, providing independent living, assisted living, memory care and skilled nursing services. Juniper Village Wellspring Memory Care at Brookline offers spacious lounges, welcoming grounds and a selection of apartments with private baths to choose from. Rooms are located off of well-lit, wide and private interior hallways. You will also find our community porches and activity spaces to have a comforting feel where residents can socialize with friends and family. Three restaurant-style meals are served per day along with snacks and guests are always invited. Beyond meals, recreational and wellness programs are proactively scheduled to ensure that each resident has plenty of activities to enjoy such as exercise programs, group walks, game time and live entertainment. We support aging in place at Juniper Village Wellspring Memory Care at Brookline. Beyond the essentials of transportation, housekeeping and weekly laundry and linen service as well, you'll be pleased to find that licensed nursing care professionals are on call 24 hours a day to support you or your loved one. Every month, residents receive health check-ups to ensure that all wellness needs are met. Additionally, we offer on-site health services including physical, occupational and speech therapy. Our caring staff are always available to assist with activities of daily living, including personal hygiene, mobility help and medication management. Those who suffer from advanced memory loss conditions will benefit from cuing, reminders and behavioral redirection. Join us at Juniper Village Wellspring Memory Care at Brookline and let us show you how wonderful wellness can be.